Extend your truck's cargo area with these easy-to-install bed extenders. 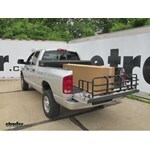 It fits on your tailgate and is easily foldable when you don't need it. These convenient truck bed bike racks simply clamp on to the side rails of your truck and you are ready to hit the trails! Best option we have since you want to keep the front wheel on would be the Topline truck bed bike rack part # UG2500 since the Insta-Gator # TH501 isn't going to work for you and there isn't an adapter available. 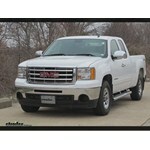 If you look at the provided photos, you can see how the Bed-Hopper will sit when the tailgate is open. As you can see, the step can be folded down out of the way so that it will not interfere with loading or unloading your truck bed. 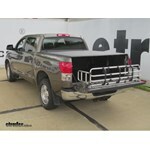 Will Topline Truck Bed 4-Bike Carrier # UG2500-4 fit 2009 Chevy Silverado With Spray-In Bedliner? Yes, the Topline Truck Bed 4-Bike Carrier # UG2500-4 is going to work just fine with the spray-in bedliner on your 2009 Chevy Silverado 1500. I have added a link to a video review of this carrier for you to take a look at as well. I went and pulled a Bed-Hopper Truck Tailgate Step, # TS2000-02, from the warehouse to check on its operation. The unit does swing freely and there is nothing to keep it stationary so it can move even when in the stored position. THis step is also available in silver using # TS2000-01. For your 2017 Ford F-150 I recommend the Swagman Patrol, # S64701, which comes with 2 fork mount carriers and can hold up to 4 road bikes or 3 mountain bikes by adding additional for mounts, # S64703. It is possible that when installing the Bed-Hopper Truck Tailgate Step # TS2000-02 that you will need to trim the bed liner of your truck. We had a customer tell us that when he installed this product he had to do a little bit of trimming to his bed liner to make it fit right. Topline states that the tire step # TH2100 can be adjusted to fit any tire size up to a 22 inch rim so that would include your 37s since the 18 in the tire size is the wheel diameter. 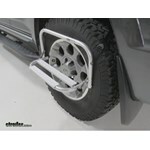 This step uses a strap to go around the tire for support rather than a rigid bar like most other tire steps which is why it can be used with larger tires. 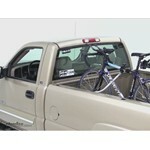 The Truck Bed 3 Bike Carrier # UG2500-3 can grab bike frames that are up to 1.03 inches in diameter. For mountain bikes that have wider frames you can instead attach the rack to the seat post. 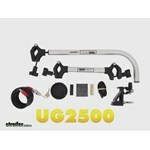 Or you could use a bike frame adapter bar part # UB01. The picture I attached shows the rack grabbing a seat post. The Topline Bike Rack part # UG2500-1 that you referenced is a confirmed fit your 2016 GMC Canyon. What a lot of guys do when they want to use this rack on a shorter truck bed is turn the front wheel so that the setup is shorter overall. I attached picture that shows how this is done.